I haven’t been able to let go of my Fabriano Venezia book yet! There are a number of photos I’m considering working into square format paintings. 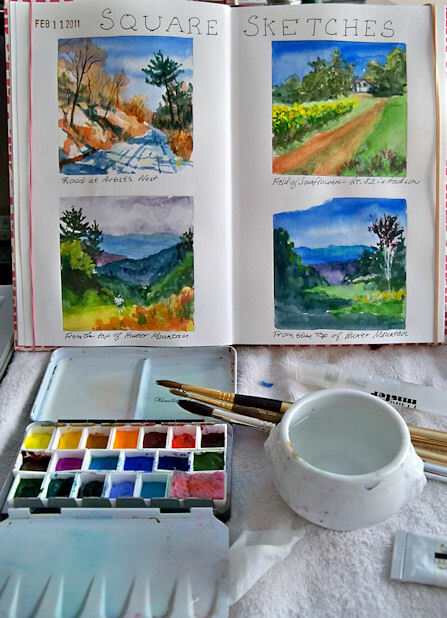 I decided to test drive some of those compositional ideas as watercolor sketches today. Here is a photo with my setup. I used a little squirrel mop travel brush for the wash stages on all four sketches, and then dried the pages with a hair dryer. Then I went back with Escoda sables to finish them. Soon I’ll have to make the difficult choice of which one to do first as an oil or acrylic painting on a panel. Anybody have a favorite? 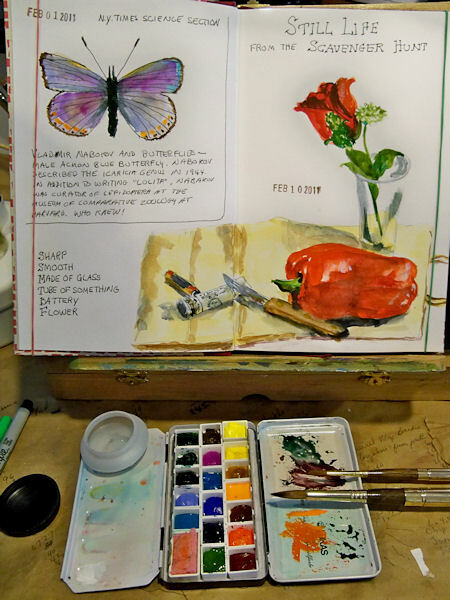 I recently got this Fabriano Venezia journal and have been looking forward to dipping into it. New journals are always a little intimidating until a few pages are underway. The nicer the paper, the harder it is to get started in them! Leaving the first page blank often helps, so I skipped over that one and filled the next two pages with some watercolor sketches. This journal is stitch bound, with very thick pages that take ink and watercolor quite well. I’m impressed with it so far, and looking forward to trying some other mediums with it, though I suspect it will remain mostly an ink/watercolor journal. It is currently at the top of my “favorite journals” list! One negative thing worth noting is that the journal does not open as flat as a Moleskine does. 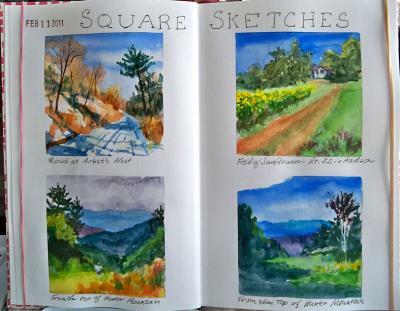 It’s so easy to draw/paint across two pages on the Moleskines; not so much on this one. In the photo above, you can see my little half pan box. This is actually only supposed to contain 12 half pans, with the center section empty for a travel brush, but I reconfigured it with 18 half pans and a whole pan that holds my little piece of sponge. When doing these quick sketches, I like having lots of colors. The two brushes shown are Escoda sable travel brushes. They come apart and the brush can go inside the gold sleeve, protecting it for travel. Last time I traveled with them though, they drove the security people crazy on the Xray machine! 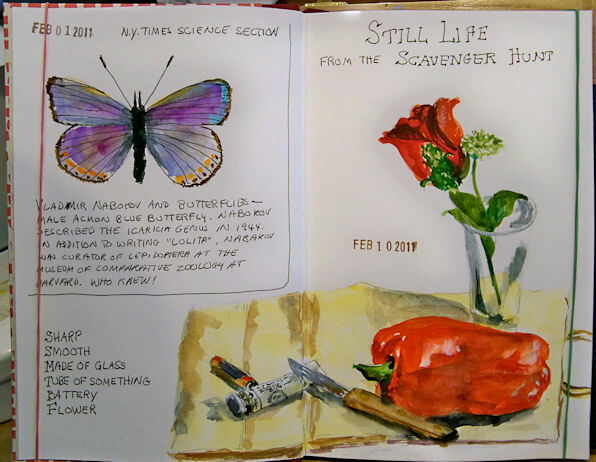 The butterfly was sketched from a New York Times article on Bladimir Nabakov’s butterfly research, and the little still life is from a sketching Scavenger Hunt posted to the Artwork from Life forum on Wetcanvas.